Last week, I published a response to a piece by Michael Vaughn at Education Post (Vaughn is their Director of Communications). I found the piece to be, frankly, little more than a collection of reformy bromides. Vaughn responded to me personally via email and asked me to post his reply on my blog. In the interest of fairness, I post Vaughn's response here in its entirety without comment. Vaughn quotes from my original post in italics. I'll publish whatever I have to say about it in a separate post. I appreciate Jersey Jazzman’s very close reading of my blog on teachers unions and the common good. He raises some very good points. Except it's not a "common" good when those charter schools clearly serve a different student population than their neighboring public district schools: fewer Limited English Proficient students, fewer students with disabilities (particularly the more profound disabilities), and fewer in the deepest level of economic disadvantage. Further, there is more and more evidence that charter school students differ from the neighboring schools' students in ways that can't be measured in the data, including parental involvement and motivation. I agree that there should be a discussion about access to charter schools and the demographics they serve. And the latest CREDO study shows that urban charters, in some cases, serve more students from low-income families and higher percentages of English-language learners and students with disabilities. I’m all for having a conversation about how to get those percentages higher across the board, and I’m all for shutting down bad charters that are not serving the public well. But unions don’t want to talk about increasing access to charter schools. They want to limit access to them. Is it wrong to point all this out? To insist that charter[s] be held to higher standards of transparency and accountability? To question whether the use of public monies to fatten the wallets of Wall Street investors is good public policy? Absolutely not wrong. Very productive conversation. Let’s acknowledge that charters can be very powerful public school options for parents and figure out ways to hold them to higher standards of transparency and accountability and—I’d add—accessibility. And let’s stop the “privatization” nonsense and the efforts to deny parents access to those options. Yes, let's celebrate insanely wealthy people giving money to destroy school districts, take over school boards, bust unions and strip middle-class teachers of their job protections! Yes, let’s celebrate investment in public schools. The school districts do not belong to teachers unions, nor do school boards. They belong to the public. I understand that other voices and ideas and influence horning in on what has been strictly union territory can cause fear and anxiety. But it’s time for more ideas and more voices. And no “insanely wealthy” person is forcing any parent to send their kid to a charter school nor forcing any voter to vote for a particular school board candidate (and unions do their fair share of spending on school board races). Again, more ideas and more voices. May the best idea win. That’s democracy. And all teachers have very strong job protections, and I’m not saying they should be stripped. The conversation should be: Is the protection too strong at the expense of kids? I’m all for having more investment in grossly underfunded city schools, in parental choice, in better evaluation systems, and in the democratic process. I never called anyone “greedy,” and I’m glad we agree on the sense here: I have enough money to afford a choice if my attendance-area school isn’t right for my child, and I want to deny other less-affluent parents that same power. That pretty clearly is not advocating for the common good. Funny, I thought the money I make as a teacher was my money that I get paid for doing my job. I guess those pork chops I bought yesterday at the A&P were purchased with "public money" as well, huh? Yes, the money teachers make is public money that is theirs. I’m happy to help pay it, and I’d be happy to send more of my tax dollars to pay teachers. And it is totally theirs. Well, whatever is left after union dues are taken out, that is. If that money is truly, first and foremost, the teacher’s, then maybe we should ask them if they want to spend it on union dues, instead of having it automatically and involuntarily deducted from their paychecks, whether they like it or not? Instead, it bypasses the teacher entirely, never makes it to the Jersey Jazzman A&P. It goes straight to fighting against things that are good for kids: like the choice to attend a public school that’s not bound by the rigid rules and formulas of union contracts. 1) Mike, we want every student to have a good teacher, right? And you want to pay good teachers more. Doesn't that inevitably mean raising the pay for all teachers? I’m all for increasing teacher salaries…and for changing an “evaluation” system that tells me that 99% of them are fine and don’t need to improve. I think parents deserve a system that supports teachers; identifies and rewards excellence; takes action to help underperformers improve; and replaces teachers who continue to be ineffective after being given a fair chance to improve. I’d use a system like LEAP in Denver. It holds lots of promise in making those fine distinctions. And to be perfectly clear, I’m 100% fine with a system that identifies the best teachers and gets them to schools in high-poverty communities (at the expense of my kids’ schools) and pays them more for it. But granted, decisions about where to deploy the best teachers are undeniably hard decisions. As problems go, it’s certainly far better than the problem we’re trying to solve—not really knowing who the best teachers are. I don’t see how a system of treating teachers as interchangeable parts, with their compensation determined strictly by a spreadsheet, is better for the profession or better for kids. As I wrote in my post, I think there are plenty of times when union leadership is pushing the right conversation for teachers and kids. I’m hopeful for more of it. But it’s getting harder and harder to see the teachers unions as fighting for the common good when they’re so often fighting against what is clearly good for kids. The all-out assault on and demonizing of charter schools is the clearest example. Millions of children have access to a good education—an education that their families chose for them—because of the existence of charter schools. That is a powerful common good. It is, however, not a perfect one. There are bad charter schools. There are exclusionary and cherry-picking charter schools. Ditto on all of the above when it comes to traditional public schools. And in both cases, they are the vast exception. Some bad practitioners don’t make it a bad idea. Michael, there is no basis to make the claim that charters with different student populations are a "vast exception." When I looked at the aggregated statistics for the charter sector in all of New Jersey, it was clear the populations are different across the board. The evidence is clear in Florida: children with profound disabilities do not enroll in that state's charters. The same evidence applies to New Orleans; there are lots of promises that this will be fixed, but we'll see. The truth is that we have a fair number of studies on a few "high performing" charters, and next to no research about the vast majority of charters throughout the country. Many of these are for-profit operations. Many have been engaged in unethical practices thanks to lax oversight, often brought on by political lobbying by the charter sector itself. Is it wrong to point all this out? To insist that charters be held to higher standards of transparency and accountability? To question whether the use of public monies to fatten the wallets of Wall Street investors is good public policy? But instead of a constructive dialogue about how to fix those problems among all schools for the common good, the unions save their most overheated of grievance airing for charter schools. And they do so to the point of distorting a rare and wonderful thing like millions of foundation dollars being poured into city schools and high-poverty communities as destroying public education. The truth is the private monies going to charter schools are not being distributed equitably; they're being used to prop up a political agenda by subsidizing a small subset of the charter sector. Because it's a lot cheaper for billionaires to give up a few million to a few select charters than to have to pay more in taxes to bring our school funding levels up to where they should be for all schools. Charter schools serve the public, are free to the public and are accountable to the public’s elected government. And in many high-poverty communities across the country, they are powerful; they are the power that comes with choice and comes with the ability to pick the school that’s best for your child. It’s the same power that union members have and often use on behalf of their own kids. Not sure it gets more common good than that—if the good you care about is what’s good for kids, that is. But unions too often see merit-based and needs-based pay as against the common good of all teachers. 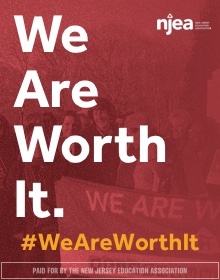 And while the Denver teachers union partners with DPS on an incentive-pay program called ProComp and acknowledged that bonuses at these high-needs schools are worth considering, it still chose to file a grievance and pledged fealty to its beloved, formulaic, pay-by-numbers salary system. Forget that teachers themselves don't want merit pay. Forget that, over and over, the Merit Pay Fairy turns out to be a myth. Forget that teacher evaluation systems do not have the ability to make distinctions at the fine levels necessary to implement a system people can trust. Forget that merit pay as envisioned by reformers is actually quite rare in the "real world." As to Vaughn's argument against LIFO: again, if you're going to take away something from teachers that they value, and you don't replace it with something else like increased pay, what do you think is going to happen to the pool of people who are willing to consider becoming teachers? LIFO and tenure protect teachers from political interference and cronyism. There's no evidence that senior teacher burnout is a big problem, but even if it were: what are you going to do to attract better teachers when you replace seniority protections with a roll of the dice? You know, it's not like I and many others haven't made these arguments over and over and over again. But Michael Vaughn and the rest of Cunningham's merry crew just don't seem to listen -- let alone learn anything -- from those of us who are in the schools and/or study this stuff carefully. They keep trotting out the same tired talking points; we keep shooting them down. Maybe that's the endgame: wear us out from repeatedly having to rebut this weakly argued nonsense. Some days, I think it's working; I do get tired of going over this stuff again and again. Thankfully, there are more and more of us (see the blogroll to the left) who are willing to demonstrate just how silly so much of the reformy argument truly is. Of course, if my union goes belly-up, I'll lose the one organization that exists to protect my rights to free speech on these issues as an educator. Will Peter Cunningham and Michael Vaughn be there to stand up for my right to challenge their arguments publicly? 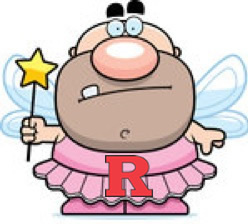 The Merit Pay Fairy says: "You ain't getting none of my money if you keep shooting' off yer big mouth, Jazzman!" Common Core Testing: Who's The Real "Liar"? U.S. Secretary of Education Arne Duncan said Pennsylvania won’t be alone in seeing lower standardized test scores after aligning its tests with core standards, and that the lower scores don’t mean students aren’t smart. Test scores across the country are expected to be lower as they are released in the coming weeks because standards have been raised on the tests that are based on the Common Core. In Pennsylvania, the tests are aligned with Pennsylvania Core. Between 2010 and 2012, more than 40 states adopted the Common Core standards in reading and math, setting dramatically higher expectations for students in our elementary and secondary schools. Now comes a critical milestone in this effort. In the coming weeks, parents in most states will receive for the first time their children’s scores on new tests aligned to the standards. The news is expected to be sobering, and may come as a shock for many. Parents shouldn’t shoot the messenger. It is important to remember why so many states started down this path in the first place. Under federal law, every state must test children every year in grades 3-8 to ensure they are making progress. That’s a good idea. Parents deserve to know if their kids are learning and taxpayers are entitled to know if the money we spend on schools is being used wisely. 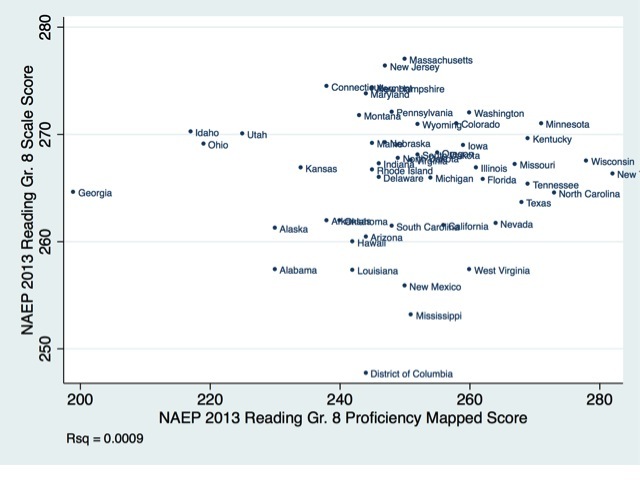 But it is left to states to define what it means to be “proficient” in math and reading. Unfortunately, most states in the past set a very low bar. They “juked the stats.” The result was a comforting illusion that most of our children were on track to succeed in college, carve out satisfying careers and stand on their own two feet. But "lying"? Please. Let's go to New York and try to show you guys what you're just not understanding. You see, The Empire State has a rather unique history when it comes to testing and "lying." Over the past several years, New York has monkeyed around with its proficiency rates more than once. And each time, pundits or politicians decried the "lying" that came before the change; in other words, the new, lower proficiency rates that the tests produced were more "honest" than the ones that came before. Up until 2009, Mayor Mike Bloomberg and Schools Chancellor Joel Klein had nearly thrown out their shoulders patting themselves on the back about the rise in proficiency rates in New York City. But in 2010, New York State reset its passing rates; suddenly, Bloomberg and Klein weren't so smug. 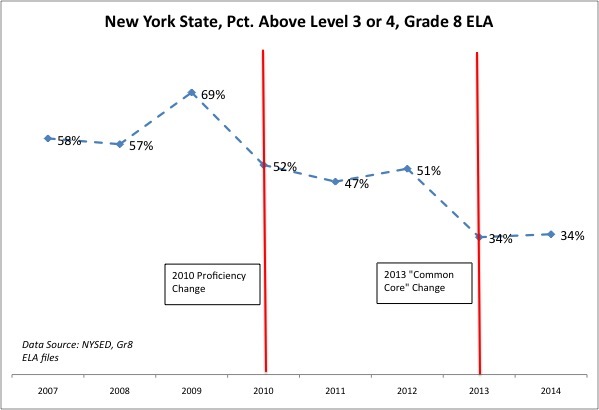 Later in 2013, New York introduced a new group of tests based on the Common Core State Standards; once again, proficiency rates (defined in New York as meeting Level 3 or Level 4 on the tests) took a nosedive. 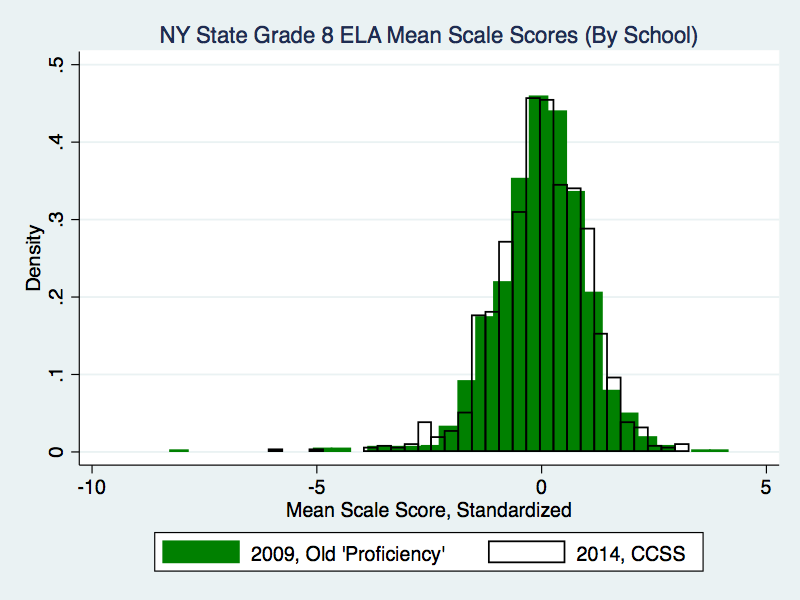 But here's the thing: were changes in the tests causing those slips in proficiency rates? Or was something else going on? 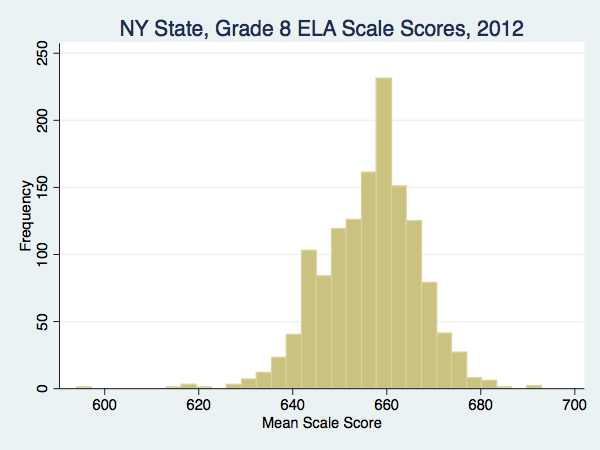 Pretty much the same thing each year, with the statewide average somewhere north of 650 points: lots of schools in the middle, a few really high, and a few really low. 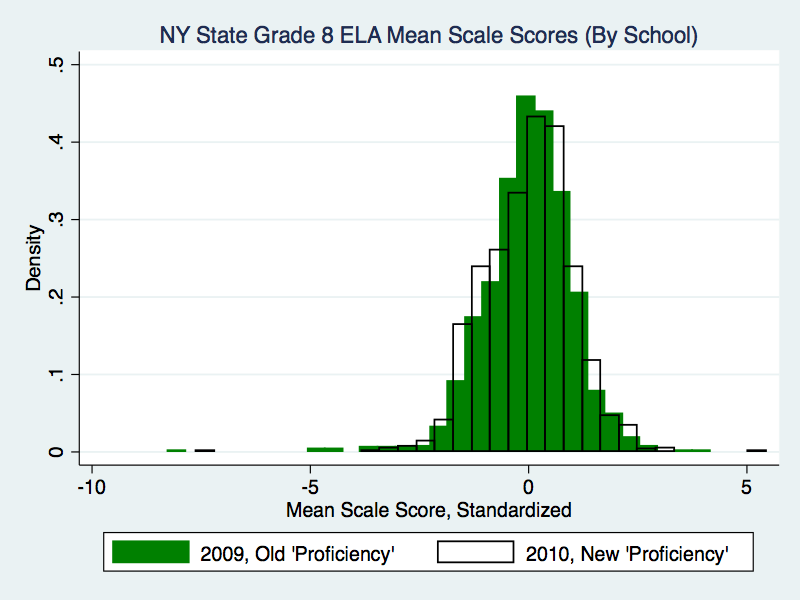 Now, the next year was that first big drop in proficiency rates for New York -- you know, when the "lying" finally began to abate. What happened to the scores? The distribution of the scores is practically the same. But how could that be? 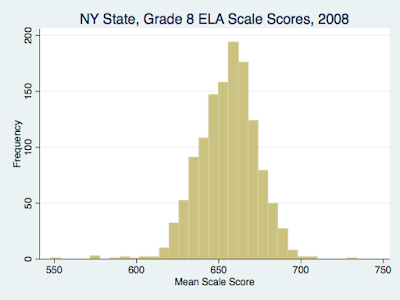 Everyone knows the scores in 2009 were "lying," and 2010's scores were much more "honest." How could they be so similar? The answer is that changes in a standardized test don't affect how its scores are ultimately distributed: it's always a normal, bell curve distribution. The tests have a variety of items: some easy, some moderately hard, some very hard. It wouldn't make sense to have a test where all the items were of the same difficulty, would it? How would you know who was at the top and who was at the bottom? After grading, items are converted from raw scores to scale scores; here's a neat little policy brief from ETS on how and why that happens. Between the item construction, the item selection, and the scaling, the tests are all but guaranteed to yield bell-shaped distributions. 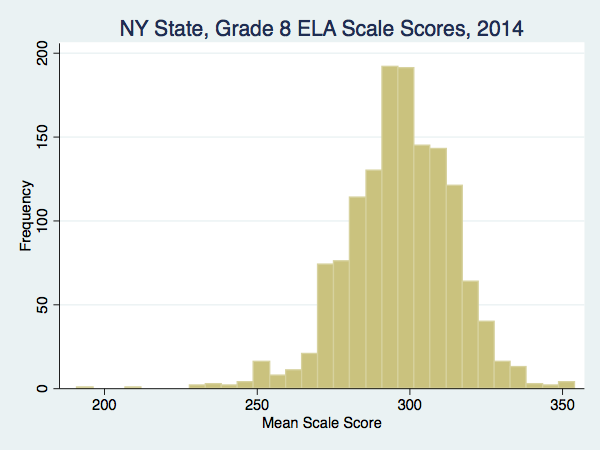 The point is this: Messing around with the proficiency rates, for reasons that may even be perfectly justifiable, does not affect the distribution of the scores themselves. Whoa, wait a minute! 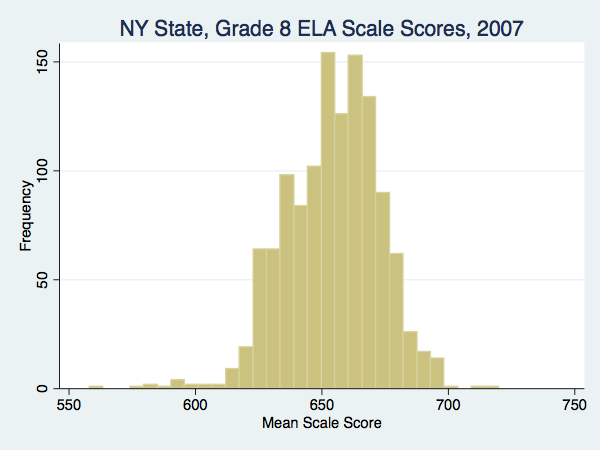 Look carefully at the x-axis: scores that were centered at around 650 are now centered around 300. What happened? Think of it as changing from Fahrenheit to Celsius: "77 degrees" becomes "22 degrees," but the temperature still feels the same. And, in this case, the distribution of scores remains the same. The scores have different numerical values, but the change is really only a matter of how to describe the distribution. 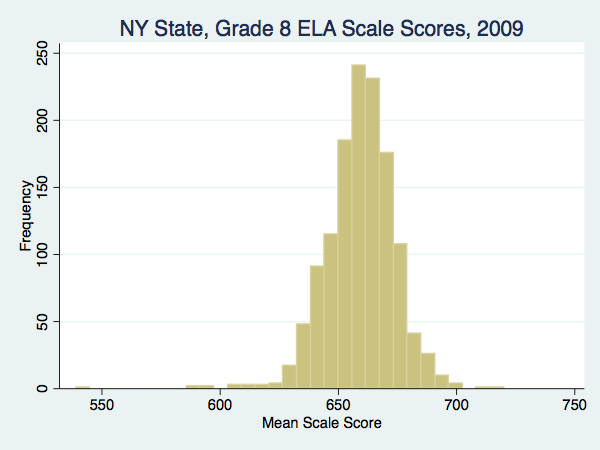 In fact, if we overlay the distribution of those "easy" 2009 scores against the same distribution of the "hard" 2014 scores (both standardized), guess what? 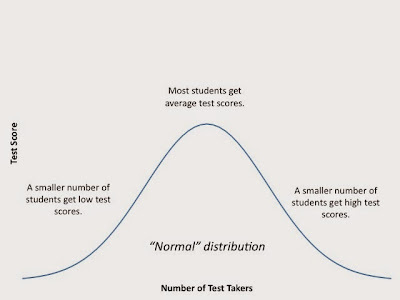 The tests might have changed in content and format, but they still yield the same normal, bell curve distribution of scale scores. I know the scatterplots make some of you crazy, but this one is pretty straightforward. Here are the standardized scale scores for each New York school in Grade 8 ELA for 2012 and 2013. 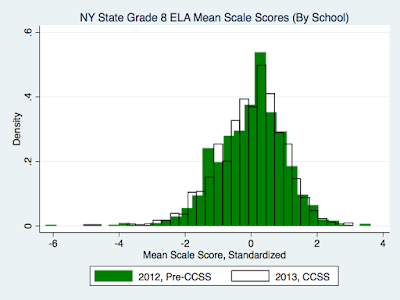 The 2012 score is on the horizontal axis; 2013 is on the vertical. Simply put: if a school had a high 2012 score, it had a high 2013 score, with a little statistical noise thrown in. If a school had a low 2012 score, it had a low 2013 score. 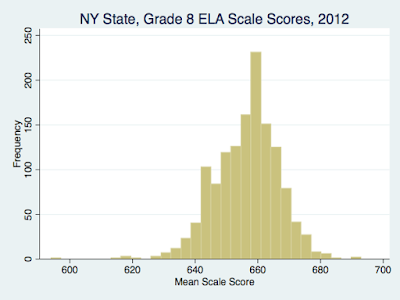 Schools that scored in the middle stayed in the middle. 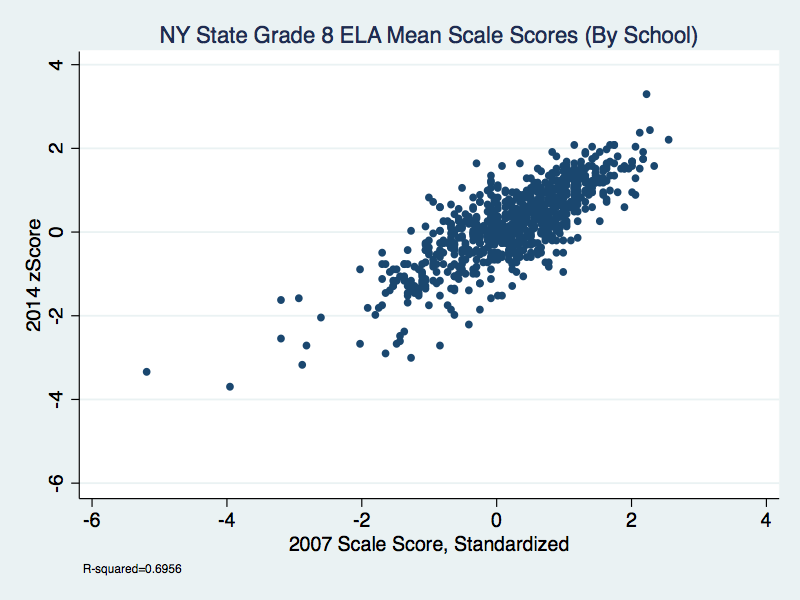 Schools that scored high in 2007 continued to score high in 2014. Even though New York's tests had gone through two major revisions of setting proficiency rates, the relative positions of schools stayed constant. So, where, exactly, is the "lying" that worries Duncan and Petrilli so much? 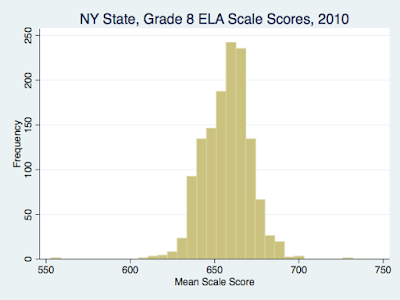 After the Common Core tests were introduced, the test scores had the same distribution, and the schools pretty much retained their positions relative to each other. Everything had remained the same! The changes in the construction of items may have dismayed parents, teachers and students. But when it comes to reporting outcomes, the only things that changed that really matter are the proficiency rates. And those can be set wherever those in power choose to set them. So if you want to do what New York did, and make a nonsense case that everyone should be able to get a B-minus in a freshman class at a four-year university, and set that as a proficiency rate... well, if you're in charge, no one's going to stop you. Even if you take the measure of this goal from an instrument -- the SAT -- that is explicitly designed to rank and order students, and use it to set the cut point for proficiency. Not everyone can be above average; someone has to be at the bottom of the distribution. In addition, we only have enough of those 4-year college seats for, at best, 30 to 40 percent of the population to earn a degree, and we have millions of necessary jobs that do not require that education, and much of college is about credentialing and not acquiring economically productive skills, and even when college students do actually pursue acquiring those skills (like STEM), most of them won't get jobs requiring them anyway. Let me make an important point here -- something I was reminded of when discussing all this with someone well-acquainted with these issues. 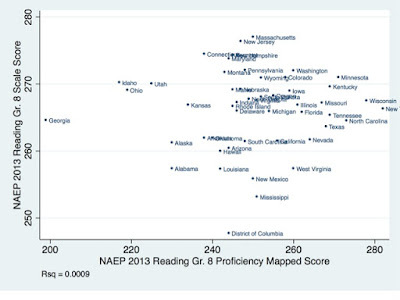 There most certainly have been cases where states have set ridiculously low standards for proficiency. The end game for doing so was to keep the revenue going to education as small as possible; that way, states could underfund their schools and still claim their children were getting a great education. At some point, we have to agree to a common set of standards if we're ever going to ensure system accountability. But raising standards by itself is not enough. Lord knows that Jersey hasn't been pulling its weight on school funding lately. 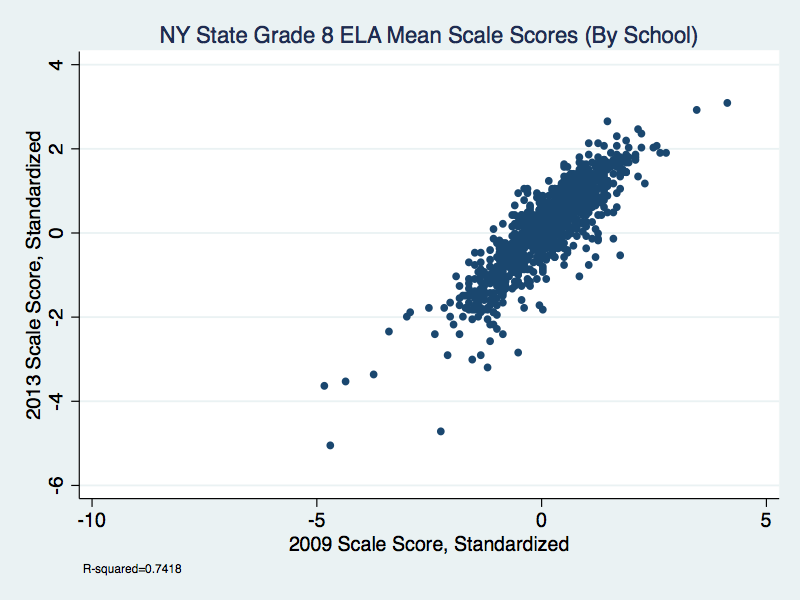 New York, however, is a particularly awful mess when it comes to funding schools: many of its so-called "failing" districts are getting screwed. This even as New York's upstate cities wither economically, and childhood poverty rates soar. Why don't I ever hear Arne Duncan talk about this? Why is he apparently convinced that moving around the cut score for proficiency on a standardized test is much more important than making sure that schools have the resources they need to do the jobs they are supposed to do? Why don't I ever read writings from Michael Petrilli's on this? Why does he think it's so urgent to move proficiency rate cut scores, even as he underplays the effects of childhood poverty on education outcomes? If you really want high performing schools, you have to make sure they have adequate funding. And if you want high-performing students, you need to make sure they come to school ready to learn. 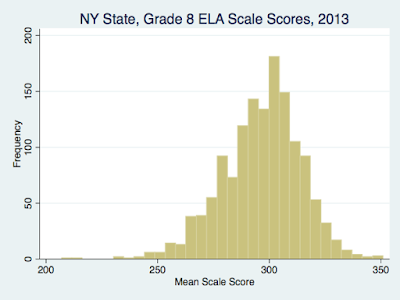 Setting the cut scores for proficiency rates may matter, but not nearly as much as funding and poverty. 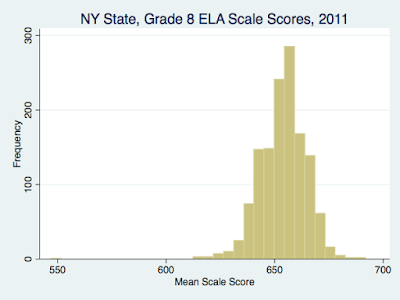 * I calculated these from weighted averages by school; might be a little bit different from "official" statewide results. Don't Believe the Data In "The Prize"
Understand, I actually liked much of The Prize. I think Russakoff does a good job of describing the struggles an urban pubic district school faces when educating students whose home lives are far from ideal. I think she tells the story of the behind-the-scenes machinations of the power players well, and I think it's important to tell that story. The Prize is turning out to be an influential book, and Russakoff is making many media appearances where she gets to present her ideas about urban school "reform." She was quoted in the NY Times by Joe Nocera, who used her figures to make the case that the Newark Public Schools (and, by extension, other urban districts) has a bloated bureaucracy compared to its neighboring charters. Connor Williams cites her figures at The Seventy Four to make the case Newark overspends on non-instructional budget items. Terry Gross hosted Russakoff on NPR's Fresh Air where, once again, she laid out the case that NPS wastes money compared to the city's charter schools, and gets better results for it. Folks, no one has looked at this more than I have (and I've had a lot of expert help). And I will tell you without the slightest hesitation: according to state data, none of this is true. Russakoff relies far too much on figures from NPS's high level administrators and far, far too much on proprietary data points from TEAM Academy Charter School, the Newark branch of the KIPP charter network. In fact, Russakoff makes the fundamental mistake (which is really amazing to me, as she is a veteran reporter with years of experience) of extrapolating what she sees at one charter school (SPARK Academy, part of TEAM/KIPP) out to the entire Newark charter sector. 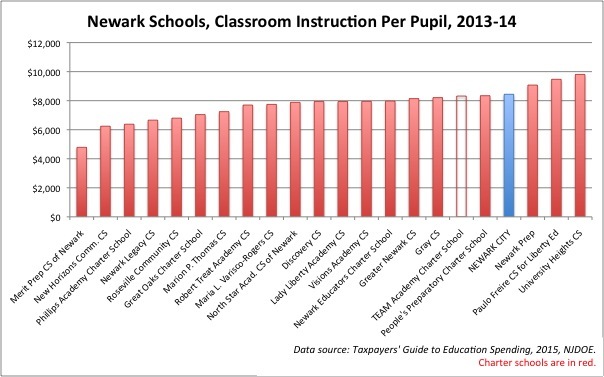 - Newark's charter schools do not devote more money to instruction than NPS. NPS spends just about as much "in the classroom" as TEAM/KIPP. 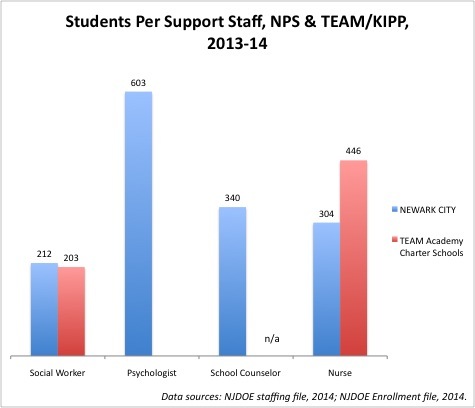 - NPS spends far more on student support services -- social work, counseling, nursing, child study team, libraries, etc. 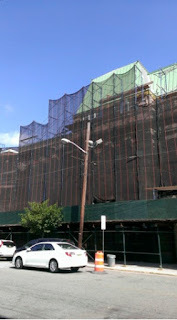 -- than any Newark charter school. No charter comes anywhere closing to spending as much on student support as NPS, probably because they serve many more special needs students than the charters. - NPS spends far less on administration than the charters. 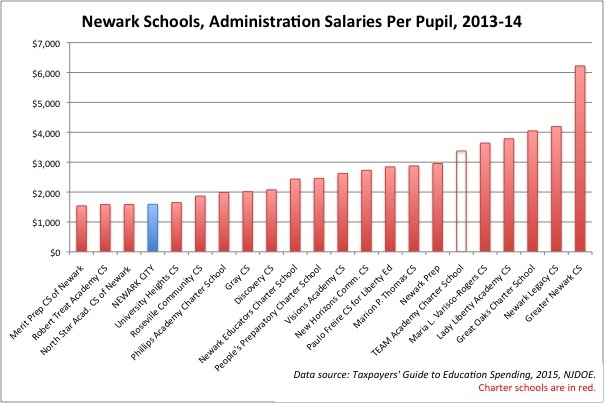 This is largely because Newark's charter schools spend a lot on administrative salaries. NPS has the lowest administration costs in the city. Why? Because their administration salary costs are low. Take a look at TEAM/KIPP's while you're here. - There is no evidence that this spending is wasted compared to the charters: NPS deploys as many teachers, and far more support staff, than the Newark charters. 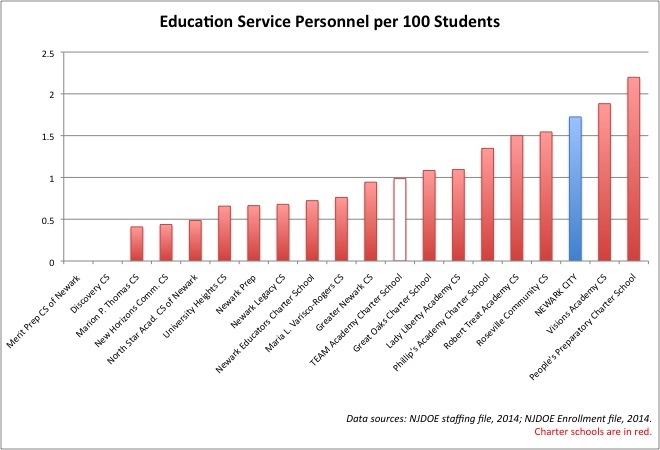 NPS deploys more support staff per pupil than most charters. Russakoff uses TEAM/KIPP as her exemplar, but they don't deploy nearly the support staff per pupil that NPS does. - NPS's physical plant costs, where we would expect to find much budgetary "bloat," are not extraordinary compared to the charters. 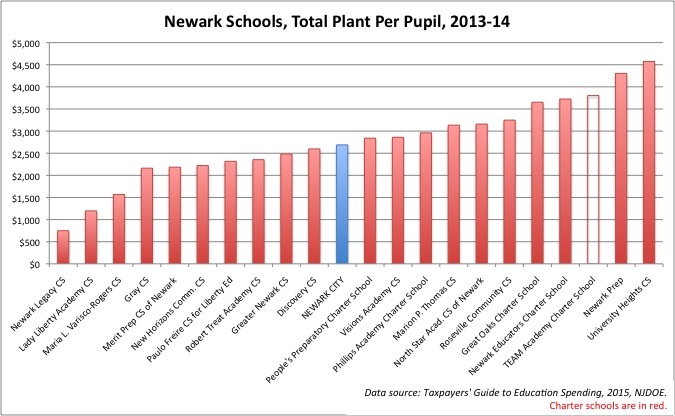 Plant costs are right at the median compared to charters. I'm not making this stuff up with a stash of super-secret data that only I can see; this is all based on publicly available figures from the NJDOE. All you need is Excel and a little patience (OK, I have some help on that front, too). There's more in the brief. No, Newark's spending isn't an "extraordinary sum in national terms." It's high, but not ridiculously high. No, there's no reason to believe an NPS school could save $800 per pupil per year on janitorial services. No, the charters really don't do better on student outcomes when you properly account for factors such as resource differences, peer effects, and student cohort attrition. No, there's no evidence the quality of teaching in NPS schools is poor compared to the charter sector; in fact, there's some reason to believe it may be better due to racial alignment and experience. No, there's no reason to believe state superintendent Cami Anderson had targeted the lowest performing schools in the district for "renewal." 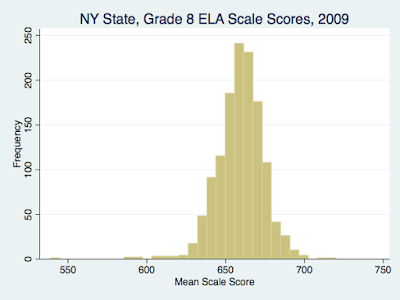 Let me be clear: not all of the outcome differences between some Newark charters and the district can be explained away by population differences, resource differences, and attrition. At some of these charters, there may be instructional practices worth emulating. Too bad our local media only ever seems to care about one charter chain in Newark, which apparently has a very good PR department. Further, there may well be "bloat" in the NPS budget; certainly, we should be looking at the high salaries for the top administrators in the system. There may well be deficits in the teaching corps at NPS, and those need to be addressed properly. And most importantly: even though the data shows NPS does not "waste" money relative to the charters, that doesn't mean NPS has the funds it needs to do its job. The district has been underfunded according to the state's own law for years now. Charter schools, which were "held harmless" in the last state budget, are a significant contributing factor to this serious problem, especially because they are not, as a sector, serving the same population as NPS. 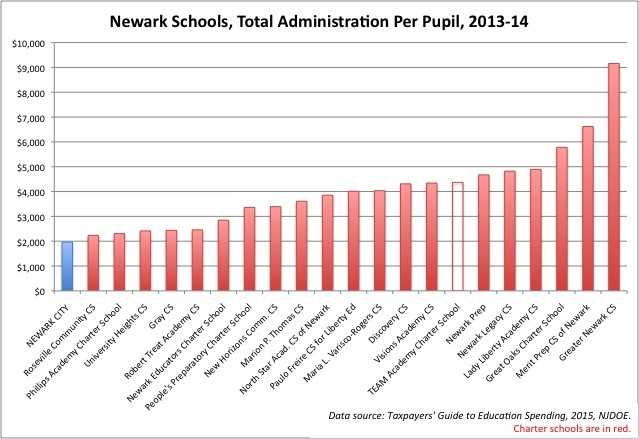 So I am not saying everything is fine at the Newark Public Schools - far from it. What I am saying is that Russakoff's diagnosis of NPS's ills is not supported by the evidence. The "facts" that Dale Russakoff has been presenting about Newark's schools, both in The Prize and in her media appearances, are either completely out of appropriate context or not supported by state data sources. Read The Prize for its political tales; it's well-written and important. But don't rely on Russakoff's data points or her analysis of education policy: they just don't hold up. The book that accurately describes the state of Newark's schools and what they have to teach us about urban education policy has yet to be written. The vacant lot that this KIPP school sits on today was supposed to be for a public district school. The state promised that it would build the school to serve all of the students in the Lanning Square area. And as the city school board waited for the state to fulfill its promises, it rebuffed an effort to bring KIPP into Camden, perhaps motivated by the fact that KIPP had already tried and failed in the city years before. But George Norcross -- a Democratic boss who runs South Jersey like Jabba the Hut runs Tatooine -- wanted a charter school on the land next to his hospital. So Democratic Mayor Dana Redd ousted the school board members who were resisting KIPP (which is quite a story itself), which allowed the charter network to take over land that was supposed to go to the local public school district. See, KIPP doesn't want those kids who haven't been with them since day one -- that's why kids in Grades 2 through 4 can go hang. The fact that the school operates under this demand is, by itself, enough to say it doesn't serve every child in its catchment. As to that waiting list: as I've said about a billion times, why would anyone be surprised that parents choose charter schools over crumbling, unsafe district schools? The Uncommon charter network made sure that the floors of their Camden Renaissance school were air conditioned during a recent heat wave, while the public school children in the same building were left to roast. Is anyone really surprised parents would want their children to go to a school that wasn't dangerous for their children's health? Why do we think it's OK to tell the parents of Camden that the only way they can put their children in a safe, clean, well-appointed school is to enroll them in a charter? Why is there plenty of money to support charters, but none available for public district schools? First of all: there's nothing "healthy" about some students at Bonsall Elementary getting air conditioning while others bake in the heat. The notion that Norcross has done nearly as much for CCPS schools as he has for the Renaissance schools is utterly laughable. Next: it's not a real "competition" when the game is rigged. If the Renaissance schools are anything like their predecessors, they will educate fewer special needs and limited-English proficient students, they will educate fewer students in deep economic disadvantage, and they will have significant student cohort attrition rates. In other words: they'll educate the students who are less expensive and leave the high-cost students in the district schools. In addition -- and I know we're not supposed to care at all about these things because "it's all about the children," but maybe it's worth pointing out anyway, because it's about people -- the teaching corps for the city will likely become more white and less experienced. I'm still waiting to hear someone explain to me how this a good thing. A hospital in New Jersey is required to submit a “certificate of need” if they’re interested in providing emergency medical services. This goes through a long vetting process by the Department of Health. The lawsuit claims Cooper circumvented the system by going straight to the Legislature. Their intent was signed, sealed and delivered into law in just weeks. “Here the Legislature has stepped in, taking that role away from the Department of Health and made these specific designations,” said Lebowitz. The law doesn’t name Cooper directly, but it gives hospitals with Level I Trauma Centers the right to run ambulance and paramedic services in their host towns. Wait a minute: you mean George Norcross's Cooper University Hospital has a monopoly on ambulance services? And the taxpayers have subsidized it?! The suit also points out that taxpayers will foot the bill. In a similarly irrational move, the Legislature and governor have approved the appropriation of $5 million to subsidize the implementation of the act. “To allow them to start up a program that Virtua has already had up and running for all this time,” Lebowitz said. That's right: just like KIPP got to take over public land set aside for a public district school, Norcross got a public subsidy to develop an ambulance monopoly in Camden. At a press conference last month, the opponents accused politics were at play, referring to Cooper board chairman and Democratic power broker George Norcross. “I couldn’t get this legislation through in two weeks, so someone has to be able to push the legislation and get the votes,” said Virtua CEO Richard Miller. “Even the sponsors of the legislation and anyone who is testifying in the hearings on this legislation said they had no problem with the quality of the services that were already being provided,” Lebowitz said. Neighbors of Cooper say for them it’s more about the monopoly they see taking place in Camden. "Because Cooper is able to and has the power and the money and the backing to swallow up whole neighborhoods, especially this area,” said Camden resident Clementine Williams. If George Norcross is all for competition, why won't he compete in an open market for ambulance services in Camden? And if Norcross really thinks competition is "healthy," why would his people make this claim? Facing the prospect of an extended CN review that could prove unsuccessful, Cooper executives opted to push for the law. Cooper representatives have also pointed to research citing potential benefits from having a single provider for both BLS and ALS services. For example, the American College of Surgeons noted in a 2008 report for the state that there are additional costs from having separate ALS and BLS providers, since separate vehicles must be dispatched for every call that requires higher-level paramedic services. Oh, you like research-based public policy, do you, fellas? Well, how about the research that shows that the resulting redundant school administrations from having both charter and district schools in the same city creates excess costs that negatively impact school districts? Where's your love of research now? It may actually make sense for there to be only one provider of ambulance services in Camden. 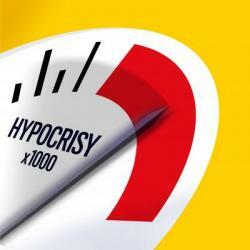 But it is screamingly hypocritical of George Norcross to demand "competition" in schools, but not in his own business. I've been looking carefully at spending figures for charter schools following my review of Dale Russakoff's The Prize. Russakoff makes an argument over and over that the Newark's charters are better at getting money "into the schools" than district schools. As I'll show shortly, the state data clearly contradicts that case. There's plenty of reason to believe the same is true regarding Camden. But Norcross wants charter schools, no matter the evidence, and whatever George wants, George gets -- even if he has to shamelessly contradict himself in the process. Jitu Brown explains how it all works, using an example from Chicago. Jitu Brown #FightforDyett from Michael Elliot on Vimeo. That's from the terrific filmmaker Michael Elliot, who was the creator of The Other PARCC, which is also well worth watching. You shouldn't be surprised when families "choose" to send their children to schools that have resource advantages, even if they lack transparency and accountability to the communities they supposedly serve. As I've said before, charter wait lists (even inflated ones) are in no way proof of the desire for "choice" among urban families. They are, instead, marks of shame for those politicians who have allowed large parts of our cities to descend into economic and social crisis. In Chicago, the exodus to charter schools is not an embrace of Rahm Emanuel's reforms; it is, instead, a rebuke. In a sane world, he would have been forced to resign in shame long ago for the damage he has done to that city's schools. 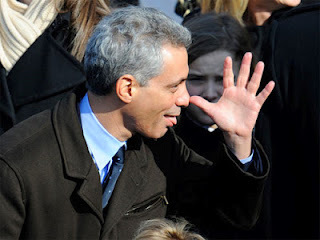 Failure, thy name is Rahm. NEWARK, NJ — Abington Ave is a crime scene. Zero planning, even less consideration. them because they are covered in plastic and sealed." God only knows what air they are breathing in at this school. Deputy Superintendents Brad Haggerty and Peter Turnamian have no kids here, so they rejected any suggestions and ordered all schools remain open. NTU is sending help. Hopefully, the Mayor's office will too. Meanwhile, in Camden, the aunt of a student at Bonsall Elementary School posts a video (which I can't embed here because it's on Facebook, so click the link to watch) showing how students on the two lower floors are sweltering in classrooms with no air conditioning. But up on the third floor, it's nice and cool. Why? Because that floor was taken over by the Uncommon charter chain, which somehow allowed the district to magically acquire the funds necessary for the school's renovation. 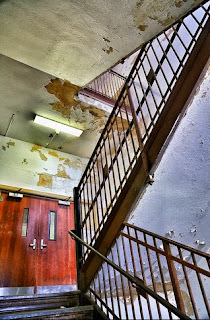 Except somehow, when it came to HVAC needs, the floors housing classrooms for the public district schools didn't get refurbished in time for the start of the school year. SMARTboards are great; I use my all the time. But they aren't much use if your students are melting. Why didn't CCSD prioritize HVAC needs over buying more technology? In addition, the excuse that the younger students are getting the A/C first is a bit of a stretch, because the plan for the takeover of Bonsall by Uncommon called for having the students in the lower grades transfer to Uncommon's supervision, while the older students remained under CCSD's umbrella. No matter how you slice it, the charter kids have A/C, and the district kids don't. Go to about 7:00 to hear the video-maker complain to the charter school "leader" about this inequity, then listen to that "leader's" response. A better example of whitesplaining you will not find. You really have to wonder what is going through the minds of Camden's and Newark's school "leaders." No business in their right mind would have allowed a reconstruction that forces windows to remain shut to take place in early September without A/C. And if Bonsall were under one principal, chances are she would have found a way to at least rotate the students in and out of the third floor so they could beat the heat. Look, we can debate about whether Newark and Camden waste money on their schools. We can argue about who's to blame for the fact that students are in rooms without air conditioning while outside temperatures are in the 90s. But I can guarantee you this: if the governor's office suddenly lost its A/C today, there would be a small army of technicians descending on the capitol. Same over at the Legislature. And at NJDOE. And at the central offices for NPS and CCSD. Because it's wrong to force people to work in very uncomfortable and potentially dangerous conditions. So why do we allow children to learn in these same conditions? And why does it take state control and the expansion of charter schools to get schools the funds for basics like A/C? Why haven't these children been in safe, comfortable classrooms from the start? 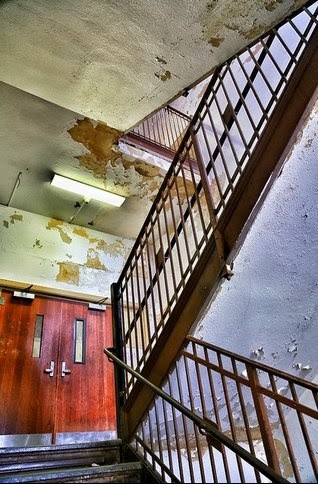 The infamous "Waterfall Staircase" at Trenton Central High. * Just to err on the side of caution, I've removed the name of the original poster of this video.